M/C Endemic takes you on an unforgettable experience through the Galapagos Islands. On this exceptional 8-day cruise, enjoy swimming, kayaking & snorkeling to discover a rare and unique marine fauna across the South & Central islands. Explore interesting rock formations and walk along to find Frigate Birds and Blue-Footed Boobies nesting right next to the rocky trails. Admire the captivating environment where flamingos, turtles, sea lions, penguins and a great variety of birds live. 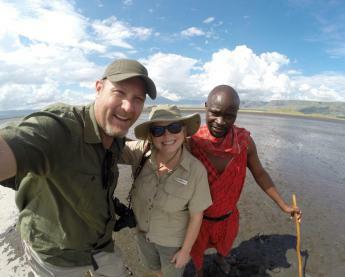 Learn all about the conservation programs run by the prestigious Charles Darwin Foundation in this unique environment which inspired Darwin's Theory of Evolution. Arrival to Baltra airport and transfer to the yacht. Dragon Hill in Santa Cruz Island is the first top for admiring a unique rocky landscape with so many land iguanas, which probably inspired the name for the hill. 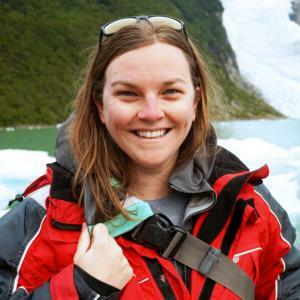 Hike along a dusty trail winding through cacti and Palo Santo trees while looking for birds, including flycatchers, warblers, flamingos and pintail ducks in the salty lagoons. Enhance your experience with snorkeling offshore following your hike. “Witch Hill” gets its name from the “pájaro brujo,” or witch bird, better known in English as the Vermilion Flycatcher. The site bewitches visitors even without the little red birds: it consists of a white coral sand beach perfect for playing in the sand, kayaking or snorkeling. It is possible to snorkel or kayak in the gentle surf off the beach. Panga rides take guests past some interesting rock formations along the island shore. Apparently, no one can agree what Kicker Rock looks like. This distinctive rock formation off the coast of San Cristobal island is called León Dormido, or “Sleeping Lion” in Spanish, but “Kicker Rock” in English. Depending on how you squint at it, it can be seen as vaguely shaped like a lion or a boot. It is one of the best snorkeling and diving sites in Galapagos: lucky visitors may get to see hammerhead sharks and sea turtles in addition to many dazzling reef fish. “Sea Lion Island” lives up to its name. 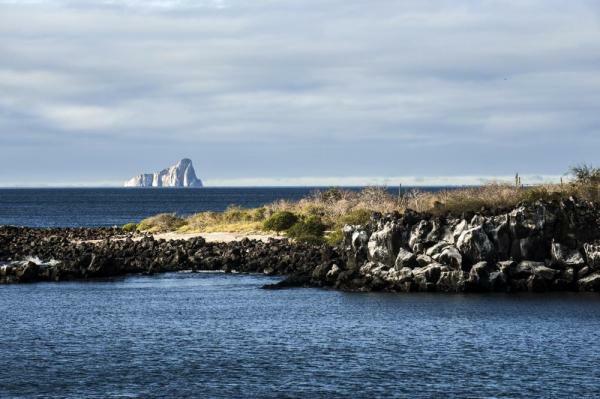 One of the best snorkeling spots in the Galapagos, Isla Lobos is a long islet parallel to the coast of San Cristobal Island, creating a calm channel perfect for beginning snorkelers. 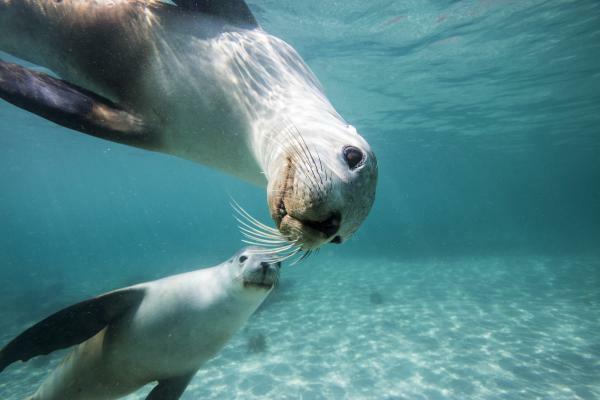 The island is home to a large colony of sea lions who sometimes splash into the water and frolic with swimmers and snorkelers. It’s also a great place to practice your kayak skills if you’re rusty! 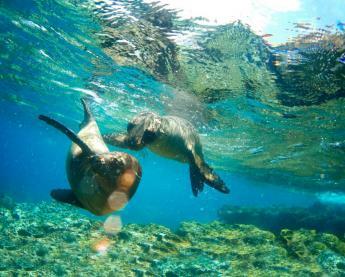 One of the best snorkeling spots in all of Galapagos, Osborn Islet is known for tranquil waters and abundant sea life. Sea lions frolic with snorkelers while brilliantly colorful parrot fish nip at the coral on the seabed. Nearby, Gardner Islet is also home to a sea lion colony. These islets are close to one another and guides may decide to go to one or the other depending on conditions. 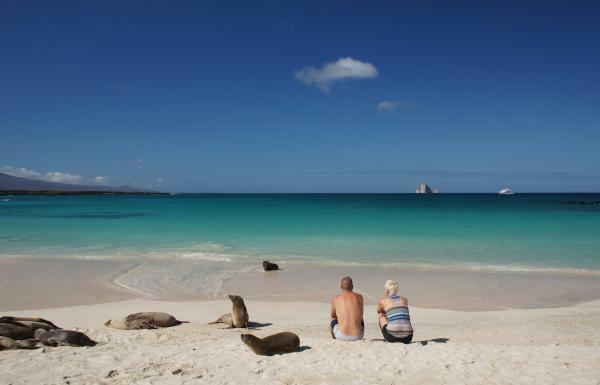 Española Island: One of only two sites on spectacular Española island where visitors are allowed to land, Gardner Bay is a gorgeous white-sand beach where guests can lounge and get some sunshine alongside sleeping sea lions. There isn’t much wildlife (crabs and marine iguanas are common, as are some wading birds) but it’s one of the best beaches in Galapagos! Those who have not had their fill of snorkeling earlier in the morning can putter around in the gentle surf off the beach. 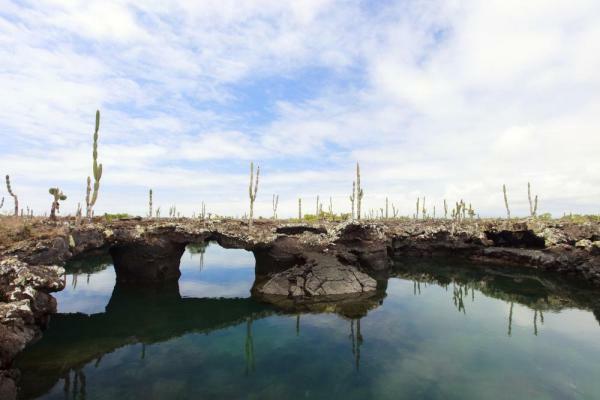 An amazing visitor site, Punta Suarez is the personal favorite of many veteran Galapagos guides. It is the only place in all of the islands where visitors can reliably expect to see the majestic Waved Albatross. The albatrosses migrate away from Española between January and April but are there for the rest of the year. 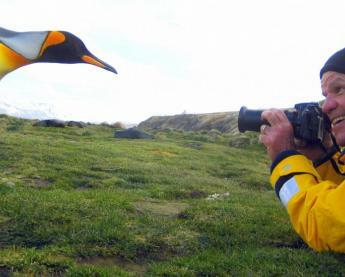 Suarez Point is also home to Nazca Boobies, Blue-footed Boobies, Red-billed Tropic Birds, marine iguanas, mockingbirds and more. Santa Fe is a small island, but it has a memorable trail which winds its way through a forest of tall, prickly cacti. The cacti are the preferred food of a booming population of endemic land iguanas. The Santa Fe rice rat, one of the few mammals native to the islands, is also found there, although the elusive rodent is seldom seen by visitors. The native population of giant tortoises on Santa Fe was wiped out by whalers over a century ago, but in 2015 some Española tortoises were released onto the island. It is possible to go snorkeling and kayaking off of the island after the hike. Named after the Galapagos Park Ranger who served for 43 years, the Fausto Llerena Breeding center is home to hundreds of baby tortoises of different sub-species being raised until they are large enough to be released. Over the years, thousands of tortoises have been released into the wild. Here, visitors can learn all about the tortoises and other conservation programs run by the prestigious Charles Darwin Foundation. 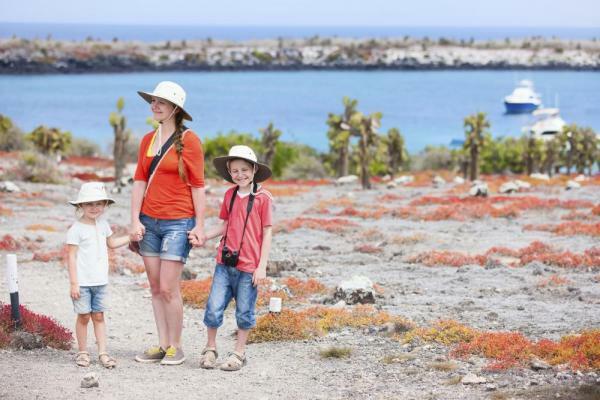 A low, rocky island populated by cacti and a healthy population of land iguanas, South Plaza Island is always a favorite among visitors to Galapagos. The island is home to the sesuvium plant, which is bright red at certain times of the year. This gives the site an otherworldly look and makes it one of the most picturesque sites in the islands. As you hike, look for booby's diving for fish offshore! Bartholomew is a small but scenic island, home to the iconic, pointy Pinnacle Rock. There are only two visitor areas on Bartholomew: a series of wooden steps leading to a scenic overlook and a small, sandy beach. There’s not a lot of wildlife on the way up the steps – look for lava lizards – but the view is spectacular. The small beach is one of the better snorkeling spots in the Galapagos, as there is a small penguin colony there and the penguins enjoy darting around snorkelers underwater. You can also see any number of fish and rays, and maybe even a shark or two if you’re lucky. Cormorant Point features two beaches and a flamingo lagoon, but oddly enough, no cormorants (which are found mostly in the western islands of Fernandina and Isabela). Cormorant point is sort of like two sites in one: the landing site is a green sandy beach popular with sea lions, but a short walk takes you to the other side of the point and a gorgeous white sand beach. You can wade in up to your ankles, but don’t go any deeper: the waters of this beach are full of stingrays! On most days, you can see dozens of them just off the beach. The Devil’s Crown is a jagged set of rocks in a roughly circular shape off of Floreana Island: they are the final remnants of an ancient volcanic crater mostly eroded over the ages. It’s a marvelous snorkeling spot: the deep water on one side is good for seeing large rays, sharks and other spectacular large marine life, while the interior of the ‘crown’ is calm and often full of playful sea lions. At one time, whalers and other ships roamed the seas, often for years at a time. For the men who worked these ships, communication with home was very difficult and they would leave letters in certain places around the globe: one such drop off was a barrel at what came to be known as “Post Office Bay.” The barrel is still there: leave your own letter for a loved one! The site also features a nice sandy beach perfect for relaxing or snorkeling. From a sandy beach, a short trail leads to the Baroness’ overlook, where visitors will get a good view of the Floreana coastline. Ask your guide for the story of the “Baroness of the Galapagos.” It’s a murder mystery which is unsolved to this day! After a visit to the overlook, there will be the opportunity to take a panga ride along the coast or take out one of the sea kayaks. Chinese Hat, named for its distinctive conical shape, is a visitor site memorable for geology and animal life. The island is known for lava tubes and pillow formations, meaning that it likely was formed underwater and later was pushed to the surface by geological forces. Besides being an informative case study in volcanic geology, Chinese Hat is home to sea lions, penguins and Sally Lightfoot Crabs. The hike is followed by panga rides, snorkeling and, kayaking. Another visitor favorite, North Seymour has something for everyone. The Frigate Birds and Blue-Footed Boobies nest right next to the rocky trail, allowing for spectacular photographs. The island is home to a booming population of Land Iguanas, often seen contentedly munching on cactus pads. There are usually dozens of sea lions near the landing site and along the beach. As if that’s not enough, the snorkeling is excellent! Black Turtle Cove is a lagoon on Santa Cruz Island. It is a maze of mangroves, and pangas are forced to paddle so that their motors do not disturb the wildlife there. See sharks, sea turtles, herons or even a school of golden rays gently gliding through the water. There is no swimming or snorkeling permitted in Black Turtle Cove. Transfer from Puerto Ayora, Santa Cruz Island to Baltra Airport. Galapagos Savings - Book before April 30, 2019 and receive $360 off per person PLUS a free round-trip ticket from Quito to the Galapagos. Select departures only. Contact us for details. Each cabin has personalized air conditioning control, a balcony, spacious private bathroom and either a king-size bed or two twin-size beds. Each cabin has personalized air conditioning control, a balcony, spacious private bathroom and twin-size bed. Final payment is due 71 days prior to departure by Bank transfer or Credit Card. Please note there is a surcharge of approximately 4.6% for payment made by credit card.